Prime Minister Narendra Modi on Saturday claimed through a tweet that he had boarded a ‘tank’ while inspecting Larsen and Toubro’s Armoured Systems Complex facility in Hazira in his home state of Gujarat for manufacturing high-end guns. Hazira is located around 30 kms from Surat. 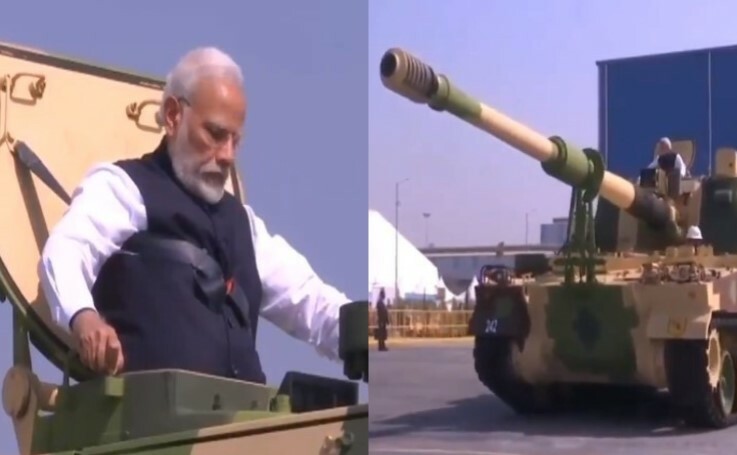 The Armoured Systems Complex, which Modi inaugurated earlier in the day, will be the first private facility in the country where the K9 Vajra self-propelled Howitzer guns will be manufactured, reported the news agency PTI. The company has reportedly set up the Armoured Systems Complex at Hazira to manufacture and integrate advanced armoured platforms, such as self-propelled artillery Howitzers, future infantry combat vehicles, future-ready combat vehicles and future main battle tanks, added the PTI report.